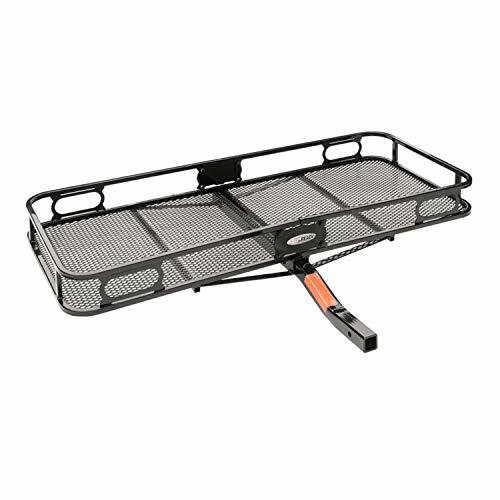 A cargo carrier is an essential thing to have when you love camping, going on road trips, or tailgating. Sometimes you just don’t have enough space in your car for everything, especially if you’re taking your whole family and pets with you. Even when you have enough space, some stuff are better off hauled outside the car. For instance, when you need to take spare cans of gas along with a portable power generator. Loading the cans in the car will make your whole car reeks of gasoline. It’s annoying and dangerous at the same time. A hitch mounted cargo carrier is a versatile and multi-purpose contraption that you can use to haul everything imaginable. Transporting trash cans, diving gears, luggage, cooler, garden supplies, tools, tree stumps, beach chairs, and everything else is made easier when you have a good hitch cargo carrier attached to the back of your car. If you want one that’s sturdy and able to withstand mountainous terrain as well as not-so-smooth highways, then you just came to the right place. Here, we review some of the best hitch mount cargo carriers that many people trust to haul whatever gears they need for their outdoor adventures. Check them out! This is one of the largest cargo carriers you can find, and it is a sturdy one. The platform measures 60-inches x 24-inches with 500 lbs weight capacity. That’s a massive load-bearing capability. It’s perfect for when you need to haul serious loads on your camping trip. The side rails are 5.5-inches high and secure everything you put on the tray. This carrier fits 2-inches car receivers and works splendidly whether you have a truck or an SUV. The whole construction is powder-coated to protect it against rust, scratches, and weather. It comes in parts, but assembly is straightforward. When you don’t need to carry too much, this 54-inches x 22-inches carrier will make a fine choice. It’s not the biggest, but it’s still spacious and strong enough to carry a ton of your camping gears. The 9-inch tall railing is a huge plus in securing everything you carry. You don’t get any assembly instruction in the package, but since you don’t have much to do anyway, it’s still pretty easy to complete. As a whole, it’s a lightweight piece of contraption. Installation is a breeze too, and since it’s not overly large, you can store it away nicely in the garage when you don’t need it for a while. This thing is highly dependable. If you often take long road trips, you can be sure this thing won’t break in the middle of nowhere. The construction feels solid. The powder coating could be better, but overall, this carrier does its job well. Measuring 60-inches x 20-inches with 2.5-inches tall side walls, this carrier provides ample extra space on the back of your vehicle. It’s made of heavy-duty steel with powder coating that protects it from rusts and scratches. There are plenty of tie-down points along the side walls, giving you the flexibility in securing the load. Assembly only takes minutes. It’s made up of two large pieces, and you only need to bolt them together. Once attached to your car, you won’t even notice it’s there. It’s unobtrusive, and there’s only slight wiggle when you load it to the max. The center platform where the metal bar is located is clearly the point where you can place most of the load. However, when you spread the load evenly across the mesh floor, you can haul up to 300 pounds. Overall, it’s pretty stable and should hold up well for years. This cargo basket is made of aluminum that doesn’t rust. This eliminates the need of fancy coating or paint to protect it. The receiver is made of thick steel piece that’s well-coated, so it’s well-protected against the weather just like the basket. Rather than mesh platform, this carrier has crossed aluminum bars. It’s much sturdier than mesh, so you won’t have it sagging when loading a single heavy object like a tree stump. Due to the number of nuts and bolts plus the lack of assembly instructions, you’ll need a good hour of your time to put this thing together. The holes are aligned perfectly, so assembly is straightforward. It’s great that the aluminum construction is lightweight so that lifting and installing it to the back of your car is effortless. One person can do it just fine. A pair of reflectors is already included to improve visibility, so other drivers will notice the basket better at night. Made of anodized aluminum, this lightweight carrier is rugged and ready to haul everything you can throw at it for thousands of miles. This carrier basket has 350-lbs weight capacity when using a Class 2 receiver and 500-lbs using a Class 3 receiver. The 8-inch guard rail is really something. You rarely need to tie down your loads. 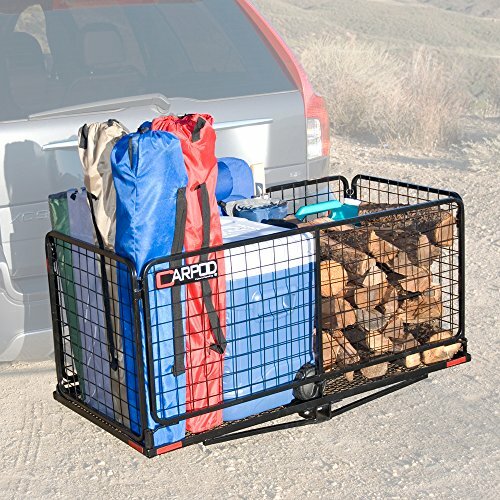 Thanks to its lightweight and compact design, this carrier basket is easy to slide into the car’s receiver hitch. There is some play between the hitch and the basket, but you can fix this easily by wrapping Gorilla tape around the shaft. Doing this also improves its stability so that it won’t rattle, wobble, or vibrate. While assembly is easy, it is time-consuming. Spare two hours of your free time to complete the construction. There are many nuts and bolts to fix. Make sure you don’t tighten them initially and leave the main shaft for last. You’ll complete the assembly quicker. 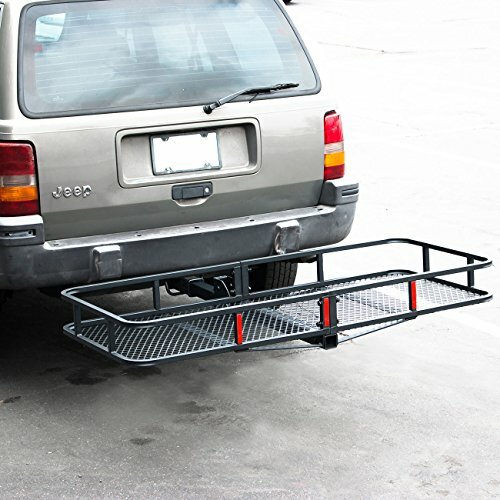 This is another aluminum hitch cargo carrier for people who want extra cargo space without spending big money. It measures 47.25-inches x 20.25-inches on the inside. That’s big enough to fit a generator, suitcase, and a bag of everything you need on your campsite. The basket has 6-inch tall railings to help things stay in place even without any tie downs. All four corners are rounded with red plastic end caps. The end of the hitch shaft also has a red marking. These along with the two red reflectors make the whole basket discernible under low light. Maxxhaul makes this from extruded aluminum. It’s made to be tough. The basket floor uses aluminum bars instead of wire mesh. It won’t sink under heavy load. This thing can take daily abuse with ease. You can leave it hanging on the back of your car even when you don’t need it. The biggest gripe about cargo carriers is that you need to uninstall them when you don’t need them for a while. Otherwise, you will compromise your parking and maneuvering capability. 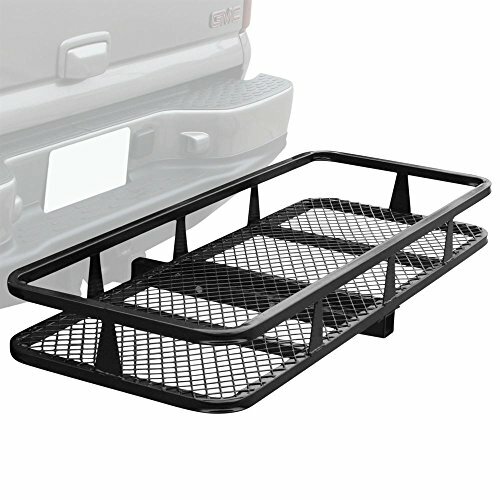 It won’t be a problem anymore when you go with a folding cargo rack like this one. The fold-up mechanism doesn’t take away its load capacity and sturdiness. It’s still good enough to load 500 pounds of distributed weight. The tray interior measures 60-inches x 19-inches so that you can carry seriously large items. It doesn’t have railings, but it has holes for tie down straps. The carrier sits about 20-inches from your back bumper. Even if you have spare tire back there, it can still be used folded or unfolded. There are four holes on the hitch, and you can adjust the distance by locking the hitch pin on one of them. 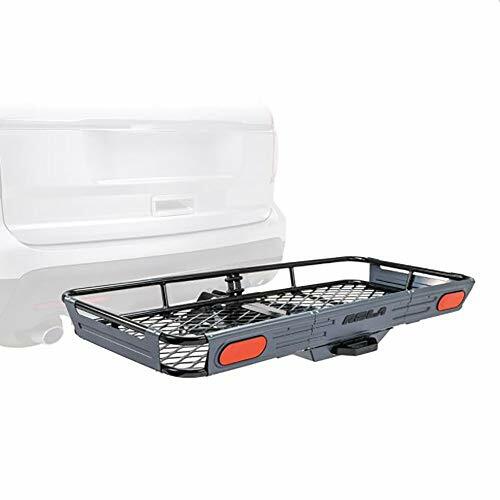 If you want a cargo carrier that’s easy to assemble, then this CargoLoc carrier is one of them. While others can take hours, this will only take fifteen minutes of your time. It has all steel construction, powder-coated to protect it from corrosion. The all-steel construction means you may need an extra pair of hands to help you assemble and install it on the receiver. This thing is heavy. Measuring 48-inches x 19.5-inches, it gives ample extra space for your camping and tailgating supplies. It has 4-inch tall sidewalls, though weirdly enough only on three sides. The one facing the bumper has no sidewall. The overall construction shows that this is a heavy-duty carrier. The nuts and bolts are heavy-duty too. You can seat two adults on this thing. It doesn’t have any holes for tie down straps, but you can use the vertical bars for that purpose. This is not just another cargo rack. This thing is loaded with features. Firstly, it’s foldable. When you don’t need it, you can grab the lift handle and fold it upright instead of uninstalling the whole tray. Secondly, it has license plate relocation holes. Fully-loaded cargo tray can obstruct the view of the license plate. If you’re anxious that this will get you in trouble with the law, just move the license plate to the back of the rack. Then, you also get a rise shank. 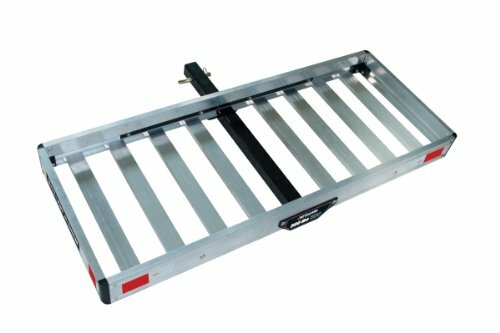 If you have a sedan or car with low ground clearance, the rise shank gives you extra inches so the tray won’t get dragged when you go through bumps or steep inclines. You get ABS skid and side plates to protect your load too. 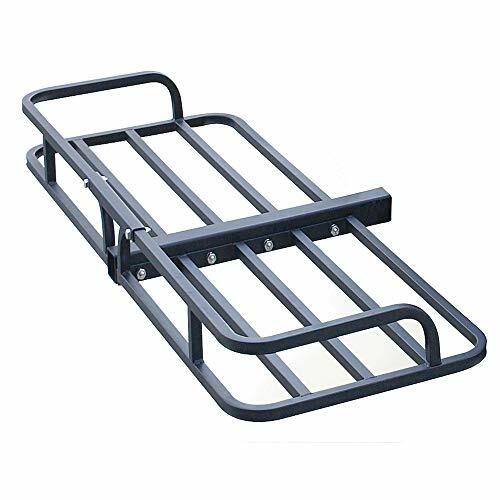 All these combined with the rack’s sturdy and durable construction, make this hitch cargo rack stand out among the competitors. 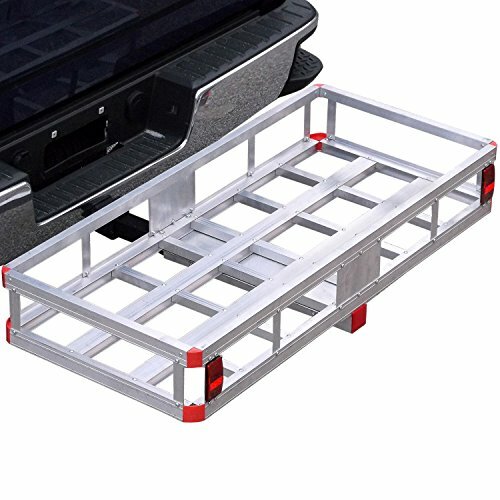 Is this just another folding cargo rack? No, it isn’t. ARKSEN makes this out of square steel tube, 3/4 –inches thick. It’s very durable with black epoxy powder coating to protect it from corrosion and weather. The well-executed coating makes this rack pleasing to the eyes. The basket is 60-inches long and 47.5-inches wide with 9-inches tall railing. The railing keeps everything you put in there secure and stays firmly in their spot. The basket is fully welded. It’s not pieces of metal bars held together by nuts and bolts. A single piece basket is very sturdy. You can rest assured that you can load it very close to the claimed 500 pounds maximum weight limit. A single piece basket also makes assembly a breeze. The steel construction doesn’t make this overly heavy. It’s still easy to lift and install on your car. If you don’t like spending hours assembling a cargo basket, get this one. This is another top-quality hitch carriers from Tricam. Assembly is very easy with this thing. The aluminum rack uses rivets instead of bolts, and it comes pre-assembled. All you need to do is connect four bolts to attach the aluminum frame to the steel shaft, and you’re done. The lack of bolts to put the tray together is a good thing because bolts come loose over time. You need to retighten them regularly or use Loctite. Installation is also a breeze. The assembled weight is only 28 pounds. Getting it into the receiver won’t break your back. Hitch pin and clip are included, so you won’t need to buy them separately. For added safety, reflective tapes are included too. Overall, it’s a nice combination of lightweight aluminum rack and strong steel shaft. They are sturdy and don’t bend under heavy load. Aluminum doesn’t rust, and with minimal care, this carrier will perform well for many years. One thing you can’t miss about this carrier is the 22-inches tall sidewalls. These tall walls enable you to stack stuff more securely than racks with short walls. The wired mesh walls are strong, and if you want more security, you can get a lockable top lid that’s sold separately. The four walls along with the base don’t need any assembly. You just lock the corner pins when you want to use it, and remove the pins to fold the walls down when not in use. The base frame is galvanized, and the sidewalls are powder coated to protect them against scratches and corrosion. When the walls are up, the interior measures 47-inches x 23-inches x 22-inches. That’s a whopping 102 gallons capacity instantly added to the back of your car.With 450 pounds maximum weight capacity, you’ll be able to haul a lot of extra gears for your camping trip. Tow Tuff designs this to be a cargo carrier as well as a bike rack. It measures 62-inches x 27-inches x 3-inches with 500 lbs weight capacity. That means it is sturdy enough to carry serious loads when used as a cargo carrier and spacious enough to carry four bikes at once. Even with the useless assembly instruction, this thing is still easy to put together. All the pieces fit perfectly, and you don’t have too many bolts to tighten. Installation is easy too. It fits standard 2-inches receivers. The only challenge is the weight. It’s made of steel and weighs 67-pounds. That might pose a bit of a challenge. Get a pair of helping hands to make it easier for you. 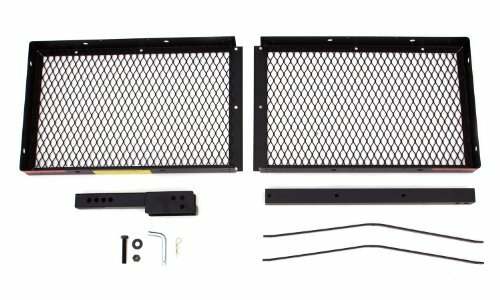 You should get this along with the Tow Tuff anti-wobble bracket that eliminates swaying and rattling of the hitch receiver. High load capacity: A 500 pounds weight capacity is the norm here, and that’s a lot. You will most likely take about 200-300 pounds of load on any trip, but that 500 pounds maximum capacity is sure a nice insurance to have. Should something happen, and you need to haul more than you used to, you know the carrier will hold out just fine. No rattles: When you’re traveling over 1,000 miles, the least you want to hear is constant rattles from the cargo carrier. The noise will make you anxious all the way. A good hitch carrier will have a tight fit between the receiver and the main shaft. Tight fit means no extra wiggling space that will make those rattling noises. Ease of assembly: When assembly is straightforward and takes minutes instead of hours, everybody is happy. Carrier racks that come pre-assembled help cut down the assembly time and also the stress that comes with it. Ease of installation: Attaching the hitch carrier to the receiver is as easy as one-two-three when you have the correct receiver size. Even when you don’t, an adapter is always easy to find. Lightweight carrier construction also helps a lot in making installation easy. Build quality: Excellent build-quality sparks confidence. You know that it won’t suddenly break while going through harsh roads. Build quality extends to the painting and coating. You’re confident that the frame, mesh wires, connectors, and everything won’t rust after just a couple trips to the mountains. Sidewalls: Railings or sidewalls surrounding the tray help keeping the load secure. Yes, you may still need to tie/strap down your load for security purposes, but having those metal railings do give you extra peace of mind. You know the load won’t slide off the rack when you’re climbing steep hills. A fully enclosed carrier basket like Carpod cargo carrier basket eliminates the need for tie downs, though. Pay attention to receiver size. Your car either has a 1.25-inches or 2-inches receiver. If the size doesn’t match the cargo carrier you like, just get an adapter. Is it big enough? Exactly how much do you need to take on your next camping trip? If you need an awful lot, get one with 60-inches x 47.5-inches rack size. If you don’t need much, then a 48-inches x 18-inches rack will suffice. Carrier measurements. A 48-inches carrier can be 48-inches measured on the inside or the outside. Double check with the manufacturer to make sure which one is it. If you want to carry a 48-inches x 20-inches box but the carrier is actually 48-inches on the outside, you’re going to have a bad time. Also, some carriers have rounded corners. You need to account for those too. 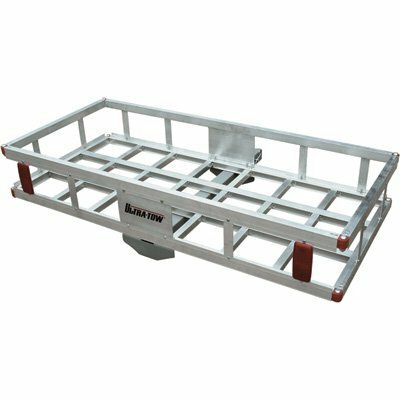 Use receiver adapter to increase the mounting height so that when you’re going through steep climbs or ramps, the carrier won’t get dragged on the road. If you have a sedan or minivan with low ground clearance, this is something to consider seriously. Mesh platform vs. bars. Skinny wire mesh doesn’t hold long, brittle and prone to rust. You need to worry about spread the weight more when you have wire mesh platform instead of bars. Any concentrated weight will break them. Mesh floor surface, however, is excellent for preventing small stuff from falling through. Of course, you can get the same result if you use a bag to put those small objects. After saying that, mesh platform or sidewalls that are made of thick wires won’t pose many problems in the future. Is a bag already included? Sometimes when you buy online, the picture shows the rack with a bag on top of it, but it’s just an illustration. Double check the product description to ensure the carrier does come with a bag. A bundle may cost less than two separate purchases. It’s great if you want to save money. Side rails. They help to prevent things from sliding off, though you can fix that with proper fastening too. Load capacity usually includes the weight of the carrier. If it says 500 pounds but the carrier weighs 25 pounds, then you can only carry 475 pounds. Steel vs. aluminum. Depending on the fabrication method, both steel and aluminum racks can display excellent load-bearing capability. However, they do have different characteristics. A tray that’s made of steel is strong but heavy. It makes attaching the carrier onto your car a challenge. Steel rack also requires more thorough painting or coating to prevent corrosion. Aluminum is lightweight, doesn’t rust, but gets scratched easily. Almost all cargo carriers you’ll see will require assembly. Some are easier than others. The most tedious part is usually putting the tray together. When there are tons of nuts and bolts involved, be ready to spend an hour or two. If that doesn’t sound like your thing, there are cargo carriers with welded or pre-assembled frames and sidewalls. Tricam and ARKSEN are two manufacturers who make those. All that’s left is to attach the steel shaft to the rack. More versatile. It makes more sense carrying firewood, trash can, or cans of gas on a hitch cargo carrier than on a rooftop rack. Easy to install. Most cars are already equipped with standard hitch receivers. Better aerodynamics. No adverse effect on your car’s mpg. Can be converted into a bike rack..
You need to worry about ground clearance, visibility and taillights. The heat from the exhaust pipe may melt any plastic part on the carrier or your load. Your load may get dirty from all the mud, grime, and dirt. Loaded rack blocks access to the tailgate or rear hatch. Blocks rear camera. Parking sensors are useless too because they’ll always sense something is too close to the bumper. Parking in tight parking spaces becomes a problem. License plate may need to be relocated. May need to install tail lights on the carrier. In a perfect world, anything you buy will have all the features that you need and want. However, we live in a less-than-perfect world and need to deal with it accordingly. 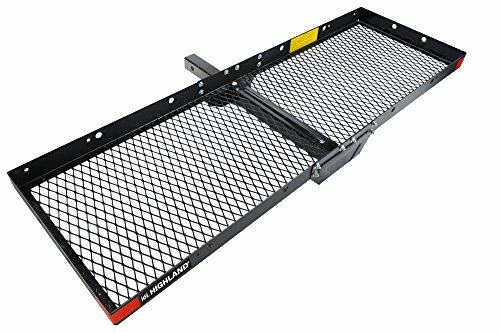 If the hitch mount cargo carrier you just bought lacks a feature or two, there are accessories available to improve the situation. Waterproof bag to protect your load from the elements. Two suitcases of wet clothes can seriously dampen your family’s holiday mood. In a pinch, garbage bag or a simple tarp works too. Reflectors/Light Cargo carriers are usually painted black or gray. In low-light situations or at nights, they can be very hard to see. For your safety and also others’, you should consider adding reflectors or a light kit. A cargo carrier light kit with plug-n-play wiring is preferable. With a light kit, you’ll have tail and turn lights functions. Added visibility is always a good thing. Anti-rattle/ trailer hitch tie down / hitch tightener. They come in various names, but they’re basically just U-shaped bolt-on devices. This simple device it applies pressure on the points of contacts to minimize and eliminate any rattling, wobbling, wiggling, or shifting. The simple design means it will work with any hitch and carrier. Curve-type hitch bar. For cars with low ground clearance, adding a curve-type hitch bar will prevent many cases of the carrier rubbing or hitting the road. It also prevents the exhaust from heating up your cargo. Hitch adapter. When you bought a cargo rack with 2-inches hitch but your car uses 1.25-inches receiver, a hitch adapter can make it work. Some hitch adapters are raised, so you get extra ground clearance for the rack. Large bumps and steep incline will no longer be a problem. When assembling the cargo, put the head of the bolts on the inside with the threads and nuts on the outside. This makes sure the sharp edges won’t tear the cargo bag or anything else you put on it. Apply some silicone on the threads’ edges so they won’t scrap anyone unfortunate enough to bump them. Worried about the mesh floor sagging? Place some plywood there to make the floor sturdier. Two pieces of ¼-inches plywood are enough for general use. Install it across the main shaft and you’ll have solid support for your load. No more worries about the mesh surface caving in when loaded with a full cooler bag. When you have a foldable cargo carrier, you should not drive with the rack folded up. At least, that’s the general consensus. Consult the user manual and see if the manufacturer clearly stated that you can drive with the rack folded. If you can’t find anything like it, be safe and drive with rack down. Don’t test the maximum load capacity right off the bat. If you buy a cargo carrier with 500-pounds capacity, try with 100 pounds first and see how it fares. There’s always a possibility that you get a lemon or some nuts and bolts aren’t properly tightened. Go for a test ride before the big day. You may notice a thing or two that you didn’t realize early on. When installing, make sure the exhaust is not pointing directly toward the rack or basket. The heat could melt your suitcase, box, cooler, or anything made of plastic. Some racks have plastic end caps to round the corners. Those could melt too. Use an adapter to increase the rack’s height and move it away from the heat. You can also use exhaust tip to redirect the exhaust away from the cargo basket. When you spot rusts, don’t worry about it too much. Something made of metal that gets used outside will get rusty sooner or later. A quick spray of Rustoleum will do well to prevent the rust from spreading. Keep using the carrier and keep having fun adventures with your loved ones. Okay, so we’ve given you the top rated hitch-mounted cargo carriers and some tips that you need to consider before buying one. Frankly, Any one of those will give you enough extra storage that you direly need. Remember, pick one that suits your needs best. If you absolutely need something lightweight, go for the one with aluminum construction. If you need extra security, then get the CarPod cargo carrier basket along with the lockable top lid. You won’t regret it.